If you play Russia Gosloto 7/49 then you should know that Sunday is the day of the draw for this once a week game. Orglot launched this draw two years after the Russian government passed the laws that created a plethora of Russia Gosloto games across the state. For those who decided to play Russia Gosloto 7/49 when it debuted, then September 10th 2005 was the date they first enjoyed this particular draw. As the name suggests, there are 49 numbers to pick from is this draw, that format will be familiar to many who enjoy lottery games across Europe. 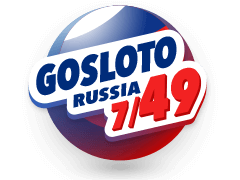 What may not be so familiar for some lottery players is how many numbers you select when you play Russia Gosloto 7/49, as the usual number in standard lottery games is 6. It will come as no shock given the title of the draw, that here that number is 7. Players will need to have all 7 of their numbers drawn to land the jackpot, but there are 5 prize divisions in this game. Thus if you play Russia Gosloto 7/49 you only need to land 3 numbers to win a prize. Our website always has the results of this draw, so check your numbers here and hope that they all match.